Historically, Illinois courts did not recognize a remedy for prenatal injuries, which are injuries suffered prior to conception or before birth. However, over time, the rule forbidding the recovery of compensation for prenatal injuries was changed on the basis that a fetus exists separately from the mother. You can now bring suit with the assistance of a Chicago prenatal injury lawyer for injuries that arise from a health care provider's negligent conduct before your child's birth. Prenatal injuries can be very stressful for new parents, necessitating hospital care and other special arrangements that may be expensive. At Moll Law Group, our medical malpractice lawyers are available to bring a claim or lawsuit on behalf of your child and you to pursue the cost of this care. Effective prenatal care requires doctors to identify women with high-risk pregnancies or high-risk infants and follow that up with appropriate care. Obstetricians are also supposed to manage any complications that arise during a pregnancy. Complications may include atypical fetal growth, gestational diabetes, identification of possible birth defects, and preeclampsia. Sometimes the situation is more complicated. For example, a mother was able to sue for medical negligence when her chromosomal structure was altered due to the use of oral contraceptives before conceiving her twin daughters. The alteration caused death to one after 3 1/2 years and a Mongoloid deformity in the other during development. When injuries sustained due to medical negligence result in a stillbirth or death during childhood, a wrongful death action can be brought against the doctor or hospital at fault. Doctors owe a duty to their patients to use the same degree of reasonable care that their colleagues in the same specialty would use given the same or similar circumstances. Although doctors usually only owe a duty in situations involving a direct doctor-patient relationship, the relationship between a doctor and an unborn infant is considered a special relationship that gives rise to a duty to avoid causing foreseeable injuries to the fetus when caring for the mother. This includes providing appropriate warnings about drugs prescribed to the mother that could cause harm to the fetus and conducting appropriate screenings. A claim for prenatal injuries accrues at birth. Generally, you have two years from the date of the injury or the date you reasonably should have known about the injury to retain a prenatal injury attorney in Chicago to bring a medical malpractice lawsuit. However, medical malpractice lawsuits must be brought within eight years when the negligent conduct that gave rise to the lawsuit occurred when the injured person was under age 18, and before the victim turns 22. Since these time limits are complicated, it is best to consult an attorney right away. As with other medical malpractice lawsuits in Illinois, an attorney's affidavit and physician's report must be attached to the complaint. This is required in every case in which a plaintiff seeks compensation for injuries or death due to hospital, medical, or other healing art malpractice. The physician's report must state that the doctor reviewed the relevant records and determined to a reasonable degree of medical certainty that the care provided fell below the minimum standard of care and should be considered negligence. 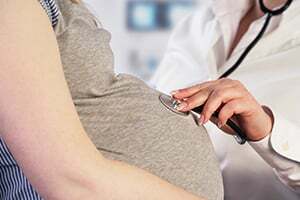 If your doctor's negligence causes prenatal injuries to your child, the Chicago prenatal injury attorneys at Moll Law Group are available to help you pursue a claim or file a lawsuit for compensation for the harm done. We also represent people in Naperville, Wheaton, Schaumburg, and communities throughout Cook County. Billions of dollars have been recovered in cases in which we have been involved. Contact us online or call us at 312-462-1700 to set up a free consultation with a birth injury attorney.